We are excited to join forces with one of the fastest growing professional soccer leagues in North America and look forward to providing great technology to its teams and fans for many years to come. Sport Ngin has been selected by the United Soccer League to develop the new USL League Network and becomes the “Official Website, Registration and League Management Software Provider of the USL”. Thousands of sports organizations have chosen Sport Ngin to run their website, tournaments, leagues, online registration and mobile apps. Through these applications, over 500,000 sports teams, clubs and leagues are able to drastically reduce the time they spend on administration and provide tools that help sports organizations manage, connect, and communicate with a diverse range of stakeholders. The USL joins the Sport Ngin Enterprise roster of clients which includes other professional league partners, national governing bodies, the PGA, Nike and professional team clients in Major League Soccer, NHL, NBA and MLB. 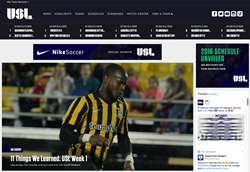 Sport Ngin is currently in the process of launching the new United Soccer League Website and USL League Network in advance of the 2016 United Soccer League season kickoff which will feature a fully mobile responsive experience, video match center and more in-depth player profiles. Helping the world play smarter and live more, Sport Ngin is the leading provider of Sport Life Management web software and mobile applications for youth, amateur, and professional sports. Powering more than 500,000 sports teams, leagues, clubs, and associations, Sport Ngin features a complete suite of easy-to-use tools that help sports organizations manage, connect, and communicate with a diverse range of stakeholders, including athletes, parents, administrators, coaches, referees, scouts, volunteers, fans, journalists, and sponsors. Founded in 2008, Sport Ngin is based in Minneapolis, Minn. For more information, please visit http://www.sportngin.com; like the company on Facebook at Facebook.com/SportNgin; or follow Sport Ngin on Twitter at @sportngin. The United Soccer League, the longest-standing professional affiliate member of U.S. Soccer, is North America’s largest professional soccer league with 29 teams in 19 states and three provinces. Through aggressive and strategic growth, the USL has more than doubled in size since 2014 and built a stable, national professional soccer league. The 2016 season marks the introduction of six teams – Bethlehem Steel FC, FC Cincinnati, Orlando City B, Rio Grande Valley FC, San Antonio FC and Swope Park Rangers. The USL’s teams are divided into two conferences -- Eastern and Western – with each team playing 30 regular season games. In addition to league play, USL teams compete in the Lamar Hunt U.S. Open Cup as well as various domestic and international exhibitions. Every game of the 2016 USL season can be seen live, free and in HD on YouTube (http://www.Youtube.com/USL), with updates from across the league also available via http://www.USLSoccer.com, Twitter, Facebook and Instagram.